I am using the ZyboZ7 to test a prototype a design in Vivado 2018.3. I have everything working but ethernet. What I can't quite figure out is the connections for CLK125, Rest and Interrupt. The ref guide shows Reset as a zynq output and CLK125 as an input in Fig 5.1, but both as bidirectional Figure 10.1. If I load up the DMA example design the pins identified for these have no connections. If I bring up my design in SDK and generate the Peripheral test it stalls on the ethernet interrupt test. I am just wondering how these signals are supposed to be connected. 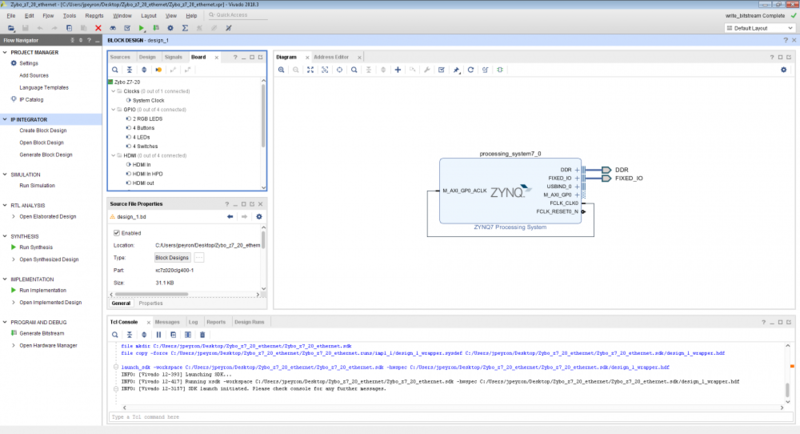 Here is the Getting started with Zynq Servers tutorial. This is made for the original Zybo but should work fine for the Zybo-Z7. 1) Please attach a screen shot of your block design, wrapper and XDC file and the TCL console text showing the errors. The block design is not set up correctly. I would suggest to start fresh using the tutorial linked above. Also make sure to be using the Digilent board files. The Digilent board files correctly configure the Zynq processor and become the default setting. OK I will look at that. BTW The DMA Example project has the same issue. I pretty much cloned this from it with the addition of the Axi Stuff. I tried the getting started tutorial as well. It doesn't work either. -- If I let it negotiate the link speed I get 1000 and it indicates that the link is up. However the Board never appears as a client on my router, And it is not reachable. If I build the the peripheral test for the tutorial design I get "Error Setting phy loopback" when I attempt to run it. 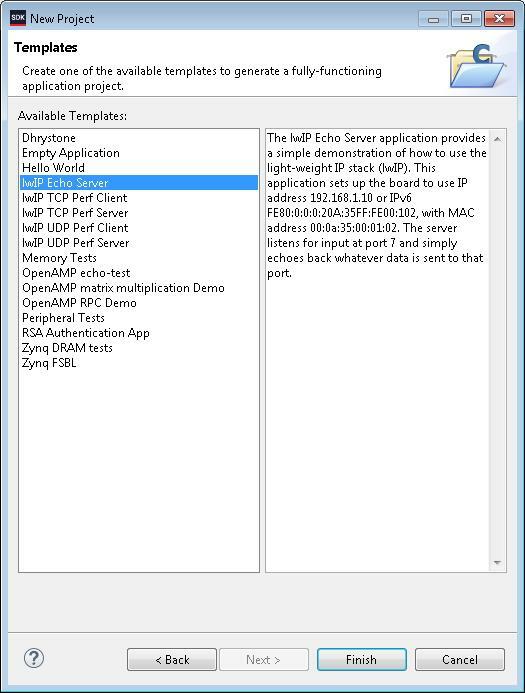 1) Are you using the LWIP Echo server application in SDK? I attached a screen shot of the LWIP echo server application. 2) Please attach a screen shot of your serial terminal when running the Echo Server application ad connected to a COM Port. 3) Are you using a serial terminal like Tera Term? 4) are you using the Digilent board files? 1) I am running the LWIP echo server. 3) I am attempting to telnet to it with ZOC (From a mac). 5) Yes the block diagram looks like that. 1) Should the Xilinx peripheral test pass? 2) Should I be able to ping the echo server? After much experimentation it appears that the issue has to do with either data communications between the MAC and the PHY or a software issue in 2018.3. (Note this is all with the basic build from the getting started guide using the ZyboZ7-20 Board file). 1) The control link to the PHY works properly. I can change the bit rate by manually setting the link speed and the LEDS on the remote side show the change. DHCP doesn't work regardless of what speed is selected, Telnet doesn't work with the echo app and the router never sees the ZyboZ7 as a client connection. 3) It appears that the may be a Xilinx support issue with the Peripheral test not working with the Realtek PHY so perhaps that is a just something to ignore. Is there a board self test that I can run to verify that the hardware is good? Thank you for the update on your hardware. Glad to hear that the Petalinux project works. I will try getting an zynq/ethernet project going with Vivado 2018.3 and see if I get the same results.